Where’s The Task Manager On My Mac? If you have recently switched to Mac OS X from a Windows computer, you may be wondering where Task Manager, which was able to stop and manage the tasks your computer did, is. 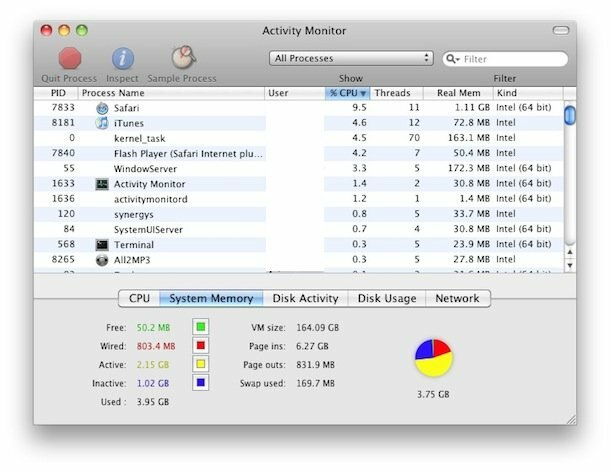 Fear not: Task Manager exists on Macs, but it has a different name: Activity Monitor. Like Task Manager, Activity Monitor allows you to see, manage, and stop things the computer may doing, from tasks, to applications, to other processes. You may feel intimidated while trying to understand such an important tool, but in reality, Activity Monitor is very simple to use. These tips should help you understand how to use your Activity Monitor to its fullest potential. One of the most important things to remember if you have recently switched from PC is that Activity Monitor is the exact same application as Task Manager, and thus works in the exact same way. Most of what you remember from your Windows program will apply to your Mac OS X. How to Find the Activity Monitor in Mac OS X? You may remember that with Windows, you could access the Task Manager through pressing Control+ALT+DEL. Accessing Activity Monitor in Mac OS X is somewhat differente. There are a few ways to launch the application. One way is to open the app within the containing directory. Another is to go through Launchpad. You could also either drag it into the Dock (your home screen), or just use Spotlight for easy keyboard access. 1. Press the command key and the spacebar, which will bring up the Spotlight search field. 2. Type “Activity Monitor” into the search bar. 3. Select “Activity Monitor” once it comes up. This should take you to the Activity Monitor app. The most useful way to sort tasks is by CPU (central processing unit), but they can also be sorted by their individual names, memory usages, or process IDs. You can also find specific tasks using the search bar in the upper right hand corner by typing in the characters or names associated with those tasks. When using Activity Monitor, you will see that it not only displays you what apps you have running at that moment, but will also show system level tasks, daemons, kernel tasks, and processes that are being done by other people who use the computer. Once you are able to access the Activity monitor, you will be able see every single thing the computer is doing. This is why Activity Monitor is so important. Once you are in the Activity Monitor app, just select whatever it is you want to end by clicking on it. From there, you will see a large red button that says, “Quit Process” in the left hand corner of the app window. Once you click that button, you will be asked, “Are you sure you want to quit this process?” As long as you have clicked on the task or application you want to stop, click on the “Quit” option that will appear below this question. If the app is still open after you try this, you should select the “Force Quit” option as an alternative, which will immediately end the process and/or close down the application without any warnings or questions. You can get all kinds of system usage info regarding your Mac OS X by looking at the bottom of the Activity Monitor app window. Simply click on these tabs to see information about the topic it is labeled with. If you want to keep tabs on live system stats and activity continually, first minimize the Activity Monitor app window by clicking on the yellow icon. From there, you should right-click on the Dock icon. This will allow various system activity monitors to appear directly on your home screen, and which will present live graphs in place of the standard icon. You can make these graphs specific to CPU (which is suggested, as it is probably the most helpful for you), network, disk activity, or RAM usage. This can help you keep track of exactly what you are hoping to monitor without any sort of confusion. If you are a new Mac user, remember that until you are more comfortable with using Spotlight and how your Mac works, it is often advised that you keep the Activity Monitor in your Dock in order to be able to view it easily. If thinking about all of this monitoring scares you, you will probably be relieved to know that you will not use Activity Monitor very often, because Mac OS X, and the applications that go with it, tends to run much more smoothly than Windows. That being said, it is always a good idea to make it easy to access, and to know how to use it, just in case something goes wrong. Usually, if something does go badly, it is most likely because of a sub-process or plugin that has been opened inside of a web browser, like Java or Flash, having some sort of problem, which can cause an app or tab to have trouble and freeze up. There are many differences between Windows and Mac OS X, but luckily, Task Manager is not one of them. As long as you remember that Activities Monitor is basically the same, it is simple to understand, and you will be a pro in no time. FAT32, Exfat, And NTFS: What’s The Difference? Informative!!! I was able to locate my mac task manager….